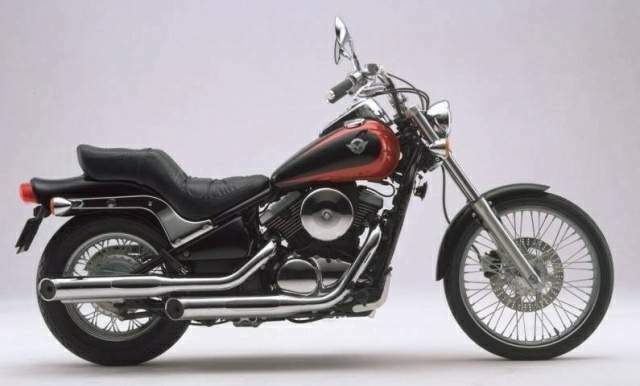 The VN800 Classic is a stylish custom cruiser, designed to look like a Harley-Davidson. 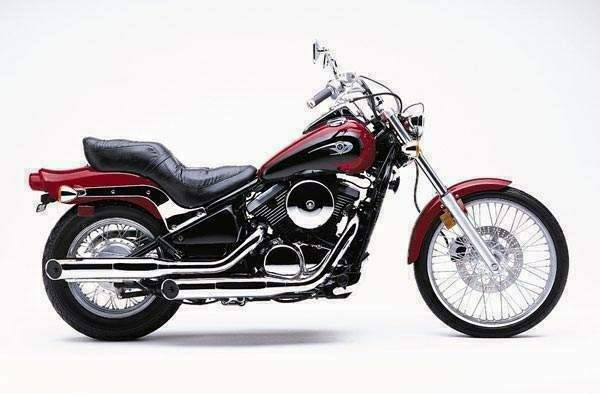 Powered by a modern, liquid-cooled V-twin engine with four valves per cylinder, the VN engine is a development of the reliable, long-running VN750 engine. In this application, it allows the long wheelbase, low-slung cruiser to top 169km/h (105mph), while providing smooth low- to mid-range power. The Classic differs from the base VN800 mostly in the styling, although it has the 40cm (16in) spoked wheels of the Drifter rather than the 53cm (21 in) front wheel of the VN. Deep, valanced mudguards, a chromed air-filter housing and fat fork shrouds complete the Classic's authentic styling. It is an unremarkable bike to ride, best used for round-town cruising. OK, so America hasn't exactly honed a new cutting edge of motorcycle technology in the last few decades. But we have shaped how the well-dressed, real steel, big-bore street-bike should look. The cruiser is an all-American icon, pioneered after WWII by Yankees, primarily out West, who figured that their Harleys, Indians, BSAs, Triumphs, Ariels, Matchlesses and all should make a more provocative visual statement. In other words, they chopped to suit. Soon motorcycle manufacturers— Harley, Norton and, in time, the Japanese—were taking those homegrown customizing ideas and turning them into production streetbikes. 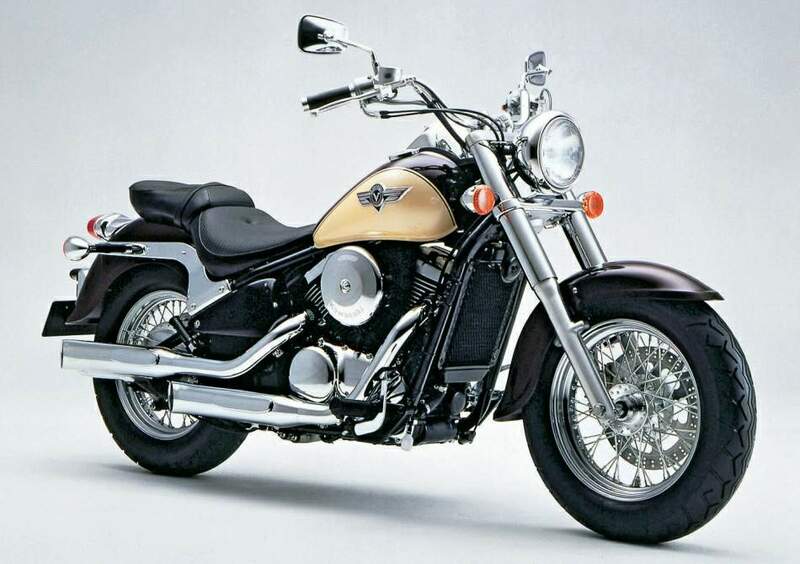 Harley excelled, perhaps partly because it took an American company to understand an American art form and partly because a big V-twin is the most fashionable centerpiece for an American-style custom. Harley's astounding success in the last decade is well documented, but, despite the fear of being stung again with something like the tariff erected to protect Harley during the 1980s, the Japanese have served notice that they won't ignore what has become the hottest segment of the motorcycle market, both in the U.S. and abroad. 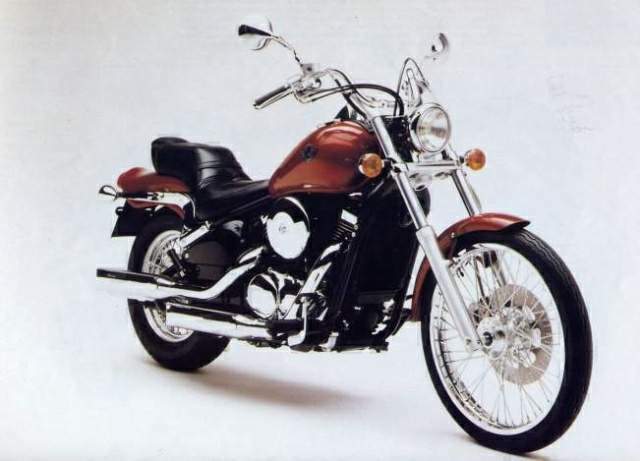 Honda's 1100 Shadow A.C.E. showed how far the Japanese were willing to go to imitate the sound and feel of an American custom. Now Kawasaki's all-new 800 Vulcan goes to even greater lengths to offer its own version of made-in-Milwaukee magic. Kawasaki, however, still manages to cruise its own road. Solid engineering advances the state of the cruiser art on every front. Although styling was clearly the primary concern, the engineers also delivered components that perform better than the usual cruiser fare. The look is pure American chopper. The front end could have rolled out of a customizer's shop: widely spaced 41mm fork tubes raked out with a 35-degree steering-head angle straddle a relatively skinny 21-inch front tire. The bottom triple clamp disappears behind a polished chrome cover, and the top clamp, which supports the pullback handlebar on short chromed risers, could have been carved from billet. To keep the lean, uncluttered look up front, a diminutive single-piston caliper pinches a single 300mm disc, while the speedo cable is routed to the rear wheel. No fork adjustment of any sort is provided, but the suspension is better sorted out than that of most cruisers. Although it will bottom if you smack a bump while braking hard, the fork provides a respectable ride, without excess softness or slack damping rates. The ride is comfortable over most surfaces and road-holding is better than most. Despite the severe rake and 5.87 inches (149mm) of front wheel trail, steering is neutral and generally light, slowing down just a bit at ultra-slow speeds. Out back, the Uni-Trak's single damper and linkage disappear behind the bodywork to maintain the visual deception of a hardtail rear end created by the triangulated steel swingarm. Your only adjustment option is a seven-step spring-preload cam, but here, too, good rate choices provide a smooth ride and good control, unless you drop a heavy passenger on the top step of the saddle and overload the spring. Although large, sharp bumps thump you a bit, most unevenness flows underneath pretty smoothly. The brakes provide confident control but modest power. Connecting the wheels is a straightforward steel frame with single-backbone-tube design, chosen to make it easy for customizers to swap fuel tanks, although the stock 4.0-gallon item is pretty and offers reasonable range. The thin radiator hides between the twin front downtubes, and most of its hoses are tucked in where they are almost invisible. The right front downtube unbolts to remove the engine in the event it requires major repair. Although based on the 750 Vulcan engine, with which it shares a common stroke measurement and 55-degree "V" angle, the 805cc engine shares few common parts. Besides the 3.1mm-wider bore, it has 0.8 of a point less compression and uses 50 percent heavier flywheels. The biggest changes are in the top end, where the 750's dual 34mm carbs have been replaced by a single 36mm carb feeding both cylinders from the right through a siamesed manifold. The 750's no-maintenance hydraulic valve adjusters were replaced by adjusting shims atop each cylinder's four valves. Sliding rocker arms permit access for shim swaps, which appears to be a fairly straightforward task. Valves are the same size but a new shape, and the cam profiles provide less duration. Perhaps most important, the obviously water-cooled cylinders of the 750 were replaced by heavily finned jugs on the 800, giving the engine a much more traditional appearance. The electronic ignition of the 750 was replaced by a more sophisticated digital system in the 800. The changes substantially rearranged the power characteristics. Although the 800 makes the same peak torque as the 750, it arrives about 3000 rpm sooner, at 3250, according to the Bartel's dyno. Peak horsepower drops about 12 percent, with our test bike cranking out 50.8 rear wheel ponies at 7250 rpm. This arrangement better suits a cruiser than the revvier 750's power characteristics, and extra flywheel mass gives the 800 a smoother flow of low-rpm power. Heavier flywheels would have mad it harder to shift smoothly without careful engine-speed matching. The 800 will chug along without lurching at low rpm, yet still pick up revs reasonably quickly, and flywheel mass isn't so great that a sloppy downshift chirps the rear tire. The changes and slightly shorter gearing produce a mixed bag of measured performance differences when we compare the 800 with the 750. At 14.22 seconds and 92.8 mph down the dragstrip, the 800 is 0.6 seconds slower but 1.0 mph faster. In our top-gear roll-on test, however, starting at 50 mph and measured 200 yards later (comparable to passing a car), the 800 hits 75.9 mph—8.8 mph faster than the 750. Open the throttle at moderate speeds and you get a lot more acceleration than on the 750. In other respects, the 800 drivetrain is agreeable after you get past some cold-bloodedness during warm-up. Throttle response is crisp and power delivery glitch-free. Clutch action is light and progressive, and the five-speed gearbox shifts quietly and smoothly with no surprises. On the highway, it can return up to 50 mpg, which dropped to 39 mpg during heavy-handed urban warfare. One of the new Vulcan's targets was a price under $7000, and one of the cost-reducing measures was chain final drive, which counts among its advantages traditional appearance and efficient, lash-free operation. The gear-driven balancer has been carried over from the 750, and in concert with rubber mounts at the front of the engine, it quells most of the single-crankpin V-twin's vibration, although some buzzing still comes at you through the stepped saddle at highway speeds. The saddle itself is made of soft foam, which bottoms out almost immediately, leaving a fairly firm perch that soon turns into a sore spot. You get the standard-issue cruiser riding position, with hands high and feet forward, a posture which not only concentrates most of your weight on the saddle, but also erects you sail-like in the wind. Kawasaki and others offer windshields to cut the wind and we recommend them to reduce the pressure on your arms and improve comfort at highway speed. Since Kawasaki intends the bike to be customized, it has its own line of accessories, including a sissy bar, rack, three different windshields, an engine guard, and a variety of leather (with or without studs) and cordura luggage. In addition, the bike was designed with an eye on enticing customizers to swap parts. For example, the portion of the rear fender normally hidden by the saddle was completely finished and free of holes or fasteners so a solo saddle can be mounted. Kawasaki has loaned prototypes to aftermarket companies to measure for bits and pieces. The plan is to get people involved with their Vulcans.